Perhaps it's just withdrawal from what was once a steady flow of Marvel Legends, but I am really getting into enjoying Marvel Select and its' offerings. I've gone from picking up the occasional release to pretty much buying everything Marvel Select is producing in recent times. I've collected a few lately without reviewing them, so here is a catch-up which includes the Marvel Select Hulk (recently re-issued), Daredevil and Spider-Man. Hulk was part of a "Best of" release in recent times, and I was pleased to have a second chance to pick him up. This is an absolutely massive figure, and a great centrepiece for a Marvel Select collection. With the massive shoulders in the way, there's not a lot of room for movement of the head, but the head is surprisingly loose. My one quibble would be the way that the black wash that's been used to define his muscles has worked on the roughish green paint. It doesn't bear for a very close inspection. Still, this giant sized Hulk is great fun, and it's inspired me to give up my futile quest for the Marvel Legends Red Hulk BAF and go for the Marvel Select Rulk instead as a companion to this big fella. I really can't say I've ever seen a brilliant Daredevil figure, and while I don't think this is it, it's a very workable Matt Murdoch for the Select line. It seems that giving Daredevil's mono-colour mask definition in action figure form is difficult, and that's the case here as well. Daredevil also suffers from a the same kind of unsubtle wash that Hulk has. Oddly, he comes with numchucks instead of his signature billy club. Daredevil has the odd sort of shape that plagued the Bucky Captain America figure - the ball jointed hips (which really don't belong on any action figure) make him look a bit, well, hippy. That seems like a lot of negatives! This is a good figure, but one more worth having for the Marvel Select collection than for the figure itself. Finally, there's Spider-Man. The first thing you notice about everybody's favourite webslinger is that his head is a slightly odd, oversized shape. His white eyes are slightly oversized and run quite a distance up the sides of his head. It's a shame, because otherwise this is a great figure. The body sculpt is excellent, without the strange proportions that bring some of the male Select figures down, and the detailing on his costume is excellent. He is a bit more poseable than some of the Select figures. A winner overall, but I have to wonder if the strangeish head was design or a production issue. One of the features of the Marvel Select figures is a detailed base, and this is the case with all three of these figures. Hulk, being a much bigger figure, has a more perfunctory metallic looking base, while the other two figures have a more substantial inclusion. 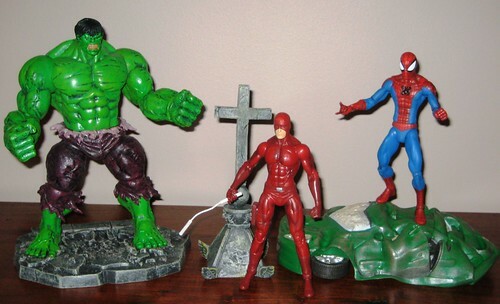 Daredevil has a church spire to hang from, and Spidey has a smashed car to stand astride. For collectors who have the display space to use these bases, they are great touches, but for me, they end up in storage, and in some cases I'd much prefer a pack of two figures than a detailed base for the price. Ball-jointed hips and potentially over-priced bases aside, one of the concerns I've had with committing to the Select line is the hodgepodge nature of previous releases, and concerns with scale, etc, but in recent times, Marvel's "big guns" have been being released in very short order and they look great together. With more on the way like the upcoming Thing, Deadpool, Cyclops and Magneto releases, a sense of a developing Select-scale Marvel Universe doesn't seem far away. You can see more pics (including in-package shots) at Facebook, discuss this at the AFB Forum, and comment on this post to enter the April AFB Comment of the Month Contest! 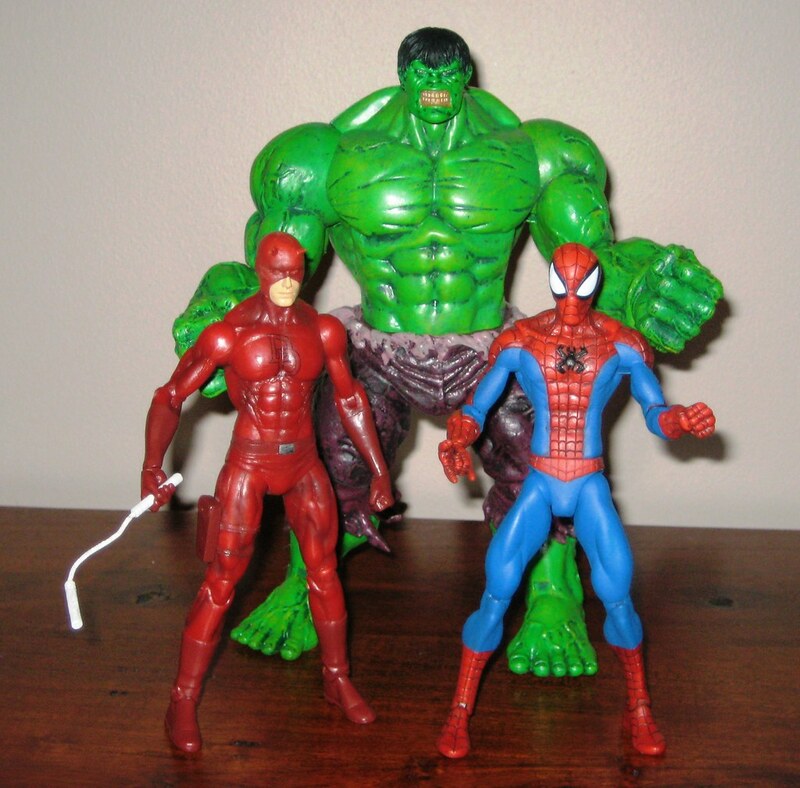 Wile I think you're being a bit kind to all three on the paint jobs, there's some nice sculpting there on Hulk, though Spidey and Daredevil both look a bit too bulky for my liking. Out of interest does anyone know who's art the Spidey is based on? Spidey looks like he's based on Mark Bagley's art. I appreciate the efforts of Marvel Select but these aren't for me. Curse you Hasbro for killing my line. I want that busted car base. Marvel Select always seems so almost there but they just keep falling a bit short. Do need to look up MS thing however. Did they opt not to do the yellow DD variant? That's the first Marvel Select figure I probably would have bought. I see no mention online and a local store has several of the red ones. I see none for sale online either. The protoype pics looked nice. Hardly any of their figures do much for me considering the price. Still want a Skrull...I liked those. The one package left at the same store has a funky paint job on one of the Skrulls. I only collect DCUC in the deluxe size but I like a lot of the sculpting on Hulky. For some reason Marvel Select and DC Direct really have just never spoken to me. hmm, DD's pecs look a tad oversized an dout of proportion. maybe this is accurate to the art? I can't say that any of those figures are doing a lot anything for me. i have found the marvel select not to bad a figure for the bases can be used to display them. not to mention the line is the only one that dared to do Mephistoe. plus love the one of Thanos the best one of the series. 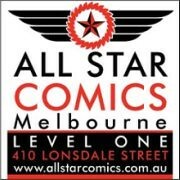 and seeing that hulk makes me want the red hulk one also.